QD Bushes are the American Standard Taper Lock Bush that is commonly found on machines imported from the USA. 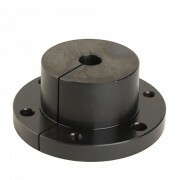 We carry a range of pilot bore QD bushes and we can machine then to the bore size that you require. The taper-bored "QD" item easily fits over the tapered bush and tightening of the cap screws produces a tight fit on the shaft. The bush is easily removed from the hub by using the pull-up bolts as jack screws. Sizes available include QH, JA, SH, SDS, SD, SK, SF, E, F, J, M, N. All bushes are available in pilot bore, and can be rebored to suit the shaft requirements. All bushes "JA" through "N” are drilled for Reverse Mounting.